This is one of my GO-TO chicken techniques and I proudly and quietly pass it on to my readers. Take it and run, let your "cook flag" fly, create all kinds of different tastes and combinations with no fear. 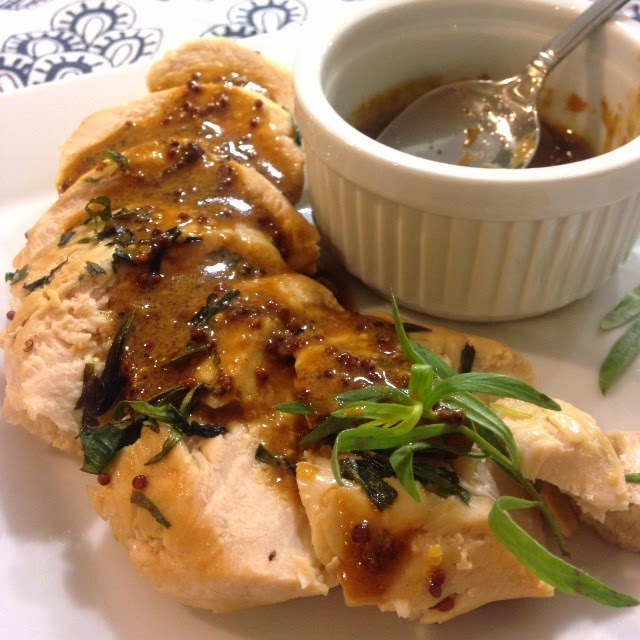 Your imagination is the main ingredient with this recipe and it makes the most tender White Meat Chicken Breast you'll ever eat. 3) Once the oven is preheated and the oil is too, place a chicken breast on each foil tray (if you're using chicken with skin, place skin side down first onto the hot oil). A) A flavoring paste (ie, whole grain mustard, ketchup, peanut butter, cream cheese, sour cream, almond butter,tomato paste, homemade jam- look into your refrigerator or pantry and create! B) A flavoring sauce that agrees with the paste you used (ie, honey with the mustard, soy sauce with the ketchup for a barbecue flavor, lemon grass with the peanut butter for a Thai accent, Lemon juice with the cream cheese or sour cream for a hint of German or Belgium, Coconut milk with the almond butter, Balsamic vinegar with the jam, etc..
5) Place the baking sheet into the oven for 8 minutes. After 8 minutes, flip each piece of chicken over and maybe spoon some of the flavorings in the pan onto the chicken pieces. 6) Now, add 1 tsp of seasoning to enhance your recipe so far: ie. tarragon, chives, lemon grass, paprika, brown sugar, sesame seeds, capers, red pepper flakes, etc. Ask yourself which one would balance the flavors you've already created. Place back in the oven, continue to bake for another 8 minutes. 7) Open the oven, quickly turn each chicken breast over, mixing in the juices. Push it back into the oven, close the door and TURN THE OVEN OFF. Let it cook with the oven off for 8 more minutes. Remove the pan and place the chicken breasts on a board to settle. While the cooked chicken rests, place the baking pan over the stove top on Medium and continue to cook each packet of sauce/gravy, stirring each one til thickened. If too dry, add a drizzle of wine or spirits, stock or for a creamy sauce add milk or half and half. For a richer sauce, whisk in a Tablespoon of butter as the sauce is cooling. Try something different for each sauce. It takes more time to tell you how to make this, then it takes to cook it; so I hope you'll try this style. My family LOVES this because it gives everyone a chance to play and to have different tastes. The flavors meld together well overnight, so it's very delicious chilled. Serve one recipe for dinner tonight, save the other for a salad tomorrow or sandwiches for guests or low points nibbling. PLUS** you can create several different global flavors in ONE PAN - ONE TIME COOKING. It makes pleasing picky eaters a breeze. It makes preparing a few meals at one time extremely fast and easy. The ideas are limitless. But, Shhh, let's keep it between us and your closest friends, ok?